7:15 AM Leave for Lost Mine Trail (4.6 miles) "2 hours, bears/mountain lions"
1:30pm Leave for Ernst Tinaja Trail (if we can make it in the 4runner) OR goto Hot Springs Historic Area. At that time of year you probably won't have much trouble getting a good campsite in the Basin campground, unless its Memorial day weekend. Your 4Runner will make it easily to Ernst, just drive civilized and you'll be fine. 7:00pm Dinner; eat a good meal." 6:00pm Chisos Mountains Lodge Restaurant"
Welcome to the board justhikeit! Is this your or their first visit to the park? Your first day is too much. If you drove to Santa Elena and back and did nothing else then that would take 2 hours driving and an hour to do the hike. You will want to stop and check out other things along the RMSD like the Dorgan house, Castolon (stop and have an ice cream sandwich), Tuff canyon, Mule Ears overlook, Sotol Vista, hike down to the Homer Wilson ranch house, Sam Nail ranch, etc. By Window Cattail trails do you mean walking down to the window and back? Your South Rim day, don't park at the cabins, park near the store and leave from there. Go up Laguna Meadows and back by Pinnacles, decide on the way by if you all have the energy to go up Emory but don't do it first thing, the South Rim is the important goal. Allow plenty of time to take it all in. There are no showers in the Basin just so you know. Only at RGV and in Study Butte. Similarly your third day might be too packed. Your 4 runner will have no trouble getting to Ernst Tinaja. If it is the first visit out there you all should go to Terlingua and sit on the front porch, have a beer, check out the view and then eat dinner at the Starlight, it is all part of getting a feel for the area. Others will have opinions on the best campsite in the Basin. Great time of year to go, the birders will be there but otherwise not so busy and if you are lucky the cactus will be blooming. Wow, thank you for the quick responses! Yes, its our first time and the other 2 guys are not from Texas so I want to get as much in as i can but be realistic and enjoy our time there. Ok, I will adjust and get back! @Mule ears, sorry that should read Cattail trails. I guess its the canyon? Ok! I changed a few things! Thoughts ? I'll SECOND and THIRD the above responses. Cattail is a good 3 hours from Ross Maxwell. On your first day, since you're going to Santa Elena, I would spend the time seeing the magnificent sights along Ross Maxwell. Take your time and soak it all I before heading back to camp and relaxing before the rest of your big trip. Enjoy! You just can't mess it up. Pretty much +whatever on everything said above. These guys know what they're talking about. I was going to play Devil's Advocate to Mule Ears and advise against using any of your time in Terlingua or at the Starlight, but if your goal is to show non-Texan friends the Texas they've always heard/dreamed about, then definitely include Terlingua in your plans. Frankly, if I were you, I'd choose either Emory or Lost Mine, but not both. They're redundant. If it were me, I'd choose Lost Mine. I think Emory is over-rated. Skip it and spend more time trying to pick your jaws off the ground at the Rim. The view from the Window is awesome at sunset, but it's almost equally awesome when seen at sunset from the porch at the Chisos Lodge restaurant with a good beer in hand. As Casa Grande and others pointed out, the drive down to Santa Elena is long and chock-a-block full of eye candy and interesting sights to stop and see and explore. Definitely go to Boquillas. Your friends will love it. The drive there from the Basin is gorgeous and you can even catch a glimpse of the Ernst Tinaja canyon far to your east as you drive. Then you can see the real thing up close the next day. Looks better. 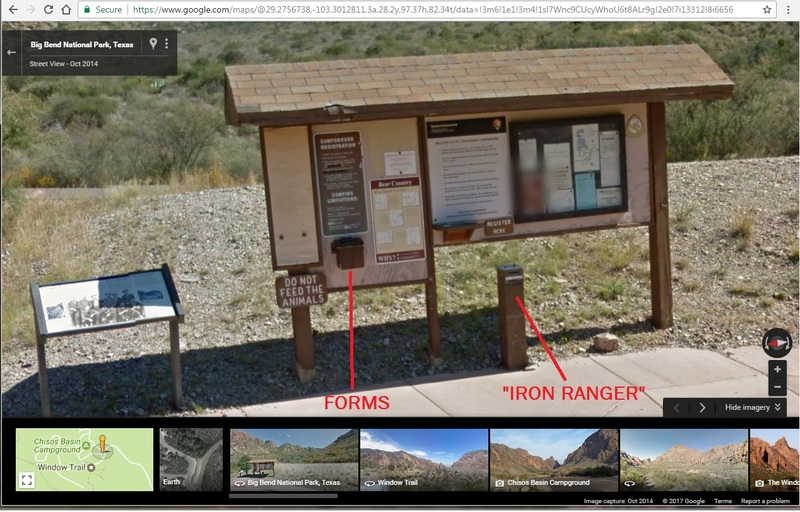 Here is the Chisos trail map if you haven't found it. Emory Peak trail cuts off from the Pinnacles trail at the top of Pinnacles Pass it adds 2.4 miles and 800' of elevation gain to your 12.6 mile loop, that is why you want to do the South Rim first and then decide if you have the energy to do the extra climb. From Pinnacles Pass it is still 3.4 miles back to the car but all down hill. The showers in Study Butte are coin operated and behind he Big Bend Motor Inn. I would echo Casa Grande, don't over plan or over think it and just let it all happen. You have a sound frame work with a day on the West side of the Park, a day in the mountains and a day on the east side of the park. On you way out the last day through the north end at least stop at the Fossil Bone exhibit and check it out and if you have a lot of time day hike Dog Canyon, it is 5 miles RT but flat. You will have a great time. Here is a good discussion of which are the best campsites in the Basin. Hit up La Kiva on the way to or back from Terlingua, if you get the chance. I consider both to be required for the Terlingua/Study Butte experience. If either is too crowded for dinner, get some excellent Mexican food at Rio Bravo. Second choice is the Chile Pepper Cafe. Not sure what you mean by "Cattail trails". The Windows Trail goes down to the Window, with the Oak Springs Cutoff (highly recommended) heads up to the right side of the Window and offers a great view out over the desert. Wonderful at sundown (bring lights if you don't like hiking back under starlight/moonlight). The Oak Springs Trail continues down to the base of the Window, where the trail to Cattail Falls is. Once upon a time you could drive to that trailhead, but now you have to hike in from Ross Maxwell Drive. Thank you so much! Ok, Ill look into campsites tomorrow. Just checked the site and looks like everything is booked. I will call tomorrow and see if I can do a first come first serve if there are any. No need to call, there are a number of FCFS sites. As you enter the campground, you'll see this on your right before you get to the campsites. Grab a form and take it with you (make sure you have a pen to fill it out). If you see an open unreserved site, fill out the form and leave the tear-off portion in the clip on the numbered post marking the site. Then fill out the envelope and put your check or cash in it and put it in the Iron Ranger. If you don't find an open one or see anyone packing up to leave, find the campground host and see if he knows of any open sites or ones coming open. On busy days he'll be out walking the campground. He'll usually have a clipboard. Not sure if he wears a uniform shirt or not, but he's always been wearing something green when I've talked to him. I'd recommend printing out this map and taking it with you. That way if the host says #59 is open you'll know how to find it. You'll also know which ones are the reserveable ones. My first good trip was close to what you have, one day each in 3 different areas. The west side to Santa Elena is an easy day. Sam Nail, Homer Wilson, Lower Burro Mesa are all short hikes as is Santa Elena itself, but that will be a long day for y'all having left Ft Worth that morning. Getting out to see the ruins and old structures will take up time. But like other's said, Terlingua is so close I wouldn't skip it. If you can get there with a little daylight, the cemetery and old adobe houses are fun to see. Then of course, the Starlight (I like the chicken fried hog and Terlingua Gold on tap). Climb to South Rim...take water, water and you'll do fine with jerky, nuts, trail bars. I took a nice cold Shiner in a Hydro Flask (learned it from this site) and had it while looking off the rim. That's a Texas thing. Dinner at the Lodge and then recounting the trip at your campsite. East side of the park, be sure you have cash....I thought the crossing was $5 but a recent article we saw, the author said $10. Then some $$ to tip the "guide" and of course lunch and drinks in town. Take your swim trunks if you do the hot springs. But going there will take almost a day. My only suggestion: On your itinerary you have *bring headlamps* for day two. You should bring a headlamp with you every time you hike more than a mile from the parking lot (I just leave mine in my hiking pack). You never know what you might get yourself into and the negligible weight of a headlamp is worth not getting caught without one at night. Based on your itinerary it seems like you're not trying to cut it close, so this is less of a comment on your specific plan and more of a comment on general hiking etiquette. Thank you! Good looking out.